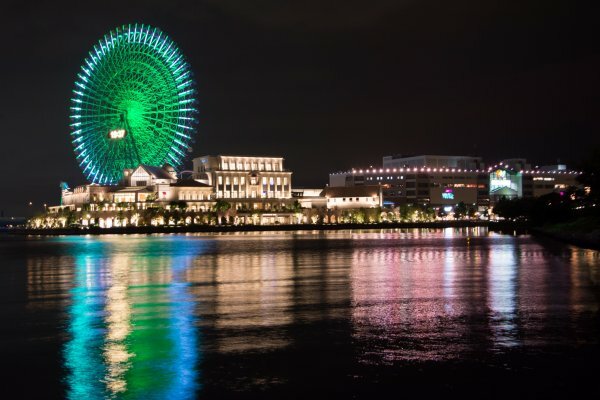 Yokohama is a great tourist destination during the day due to its variety in museums, shops, and restaurants. 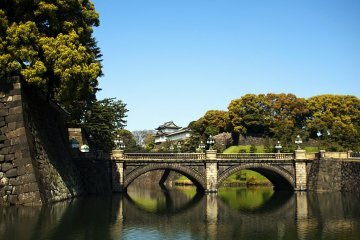 The city itself is very organized and its aesthetically pleasing architecture is also a great sight in itself. 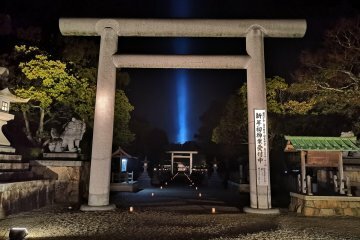 If you have an extra day in your trip itinerary I would suggest Yokohama as a day trip from Tokyo as it is only about forty minutes away by train from Tokyo. 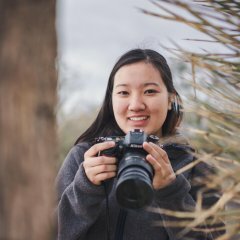 However, if you're like me and plan to do too many things in one day, you'll find yourself scrambling for time to visit all the desired locations. 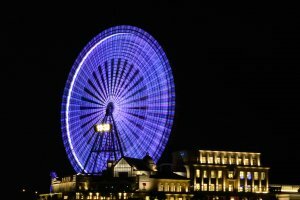 I found that I only had an evening to spare for Yokohama, and I almost decided that it would not be worth it to go to Yokohama just for a few hours, but I proved my thoughts wrong as I visited anyway and enjoyed the time I spent very much. 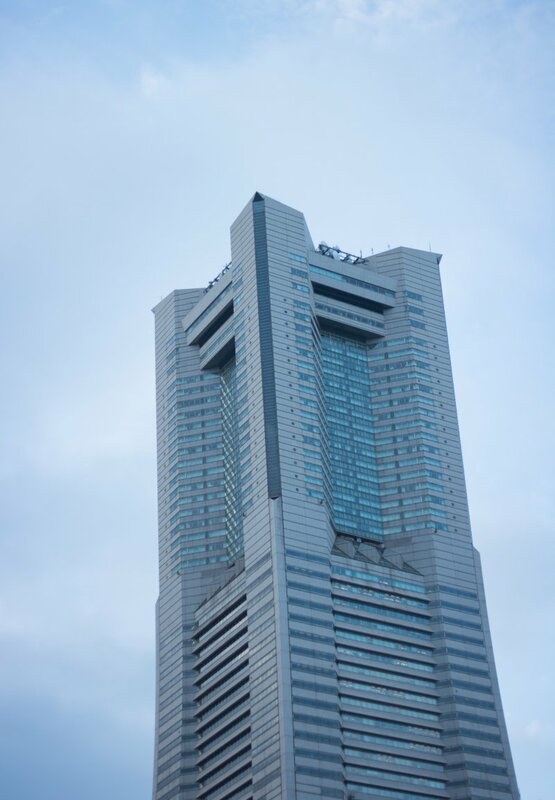 I arrived in Yokohama at about 5:30pm, before the sunset. 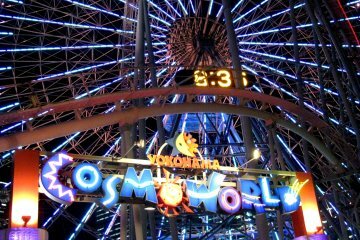 I walked around for a bit, and ended up walking to Cosmo World, the amusement park featuring the large ferris wheel, Cosmo Clock 21. 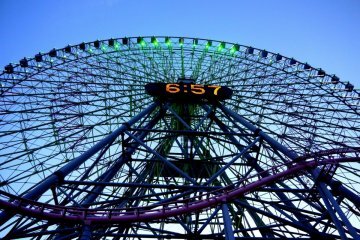 The rides looked thrilling and fun in the theme park, and I was tempted to try them, but I did not have enough time to wait in line. If I had to choose one ride that I would've ridden, I would recommend the "Vanishing Rollercoaster," as it was the most popular and had the longest line. It was also the ride with the most people screaming with enjoyment! 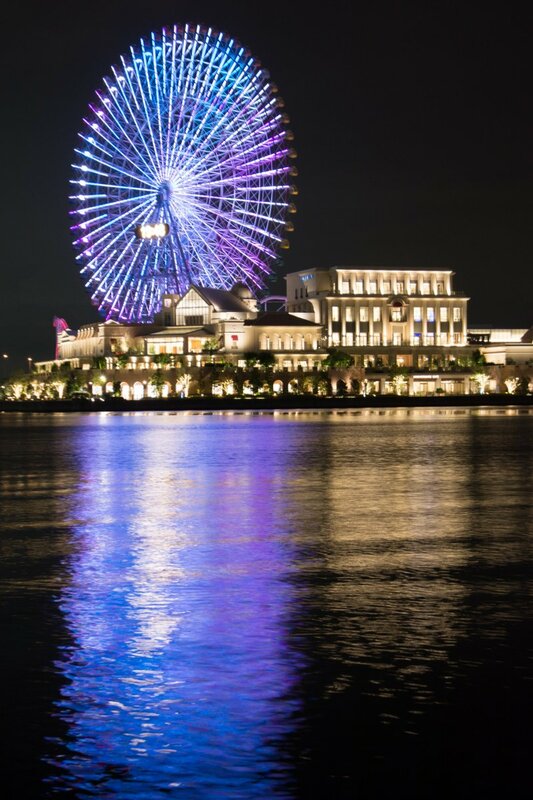 A little after sunset time, I walked back to the pier to take some photos of the now brightly lit ferris wheel. 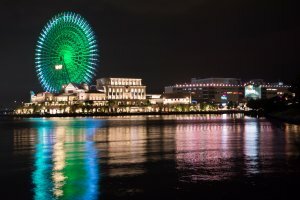 My goal in Yokohama was to take some long exposure photographs of the ferris wheel, so I sat down on the pier with my tripod and began shooting at around 7:00pm. 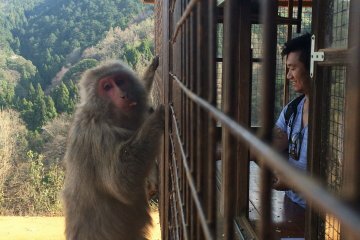 I shot for about an hour, and was delighted by the results, so I packed up and headed back to Tokyo. 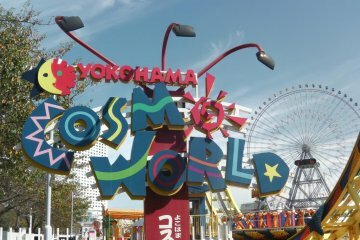 Even though I was not able to do much in Yokohama, I felt enriched by all the sights I got to see, and was very satisfied with my spontaneous decision to hop on a train to Yokohama in the late afternoon from Kamakura. 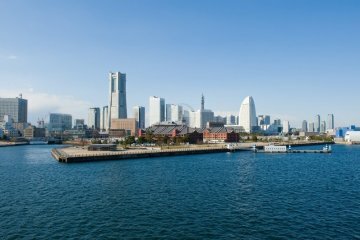 If even to take some photos, I would say Yokohama is worth the short train ride. 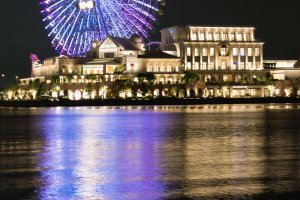 The Cosmo Clock 21 is so fabulous at night! 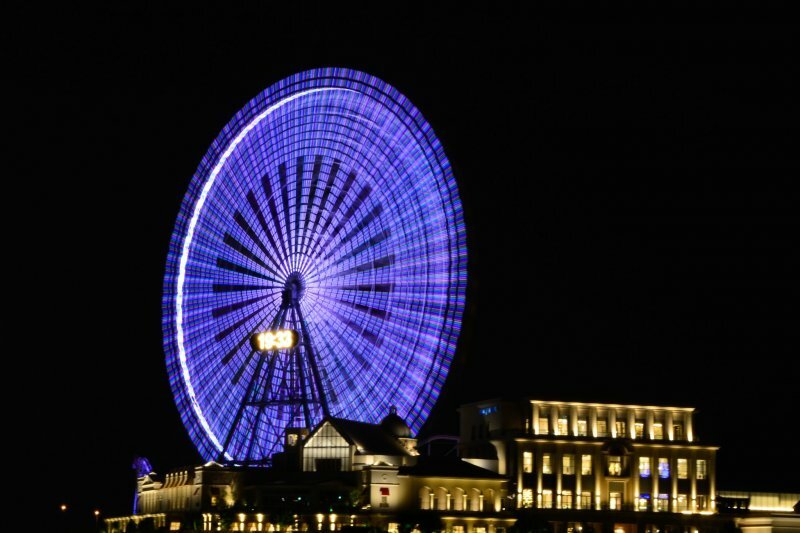 The rainbow rotation of colors and the color show on the wheel repeats ever fifteen minutes, so make sure to catch at least one of the five minute light shows! During my visit, when the light show wasn't being presented, the ferris wheel was lit up in green and white. 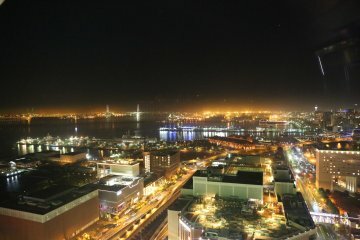 To sum it all up, if you even have a few evening hours to spare, it would be a shame not to squeeze in Yokohama, as it is so close to Tokyo.